Festivals have always been a great occasion for celebratory foods, and all around the world there are wonderful recipes for dishes that are traditional celebration foods. Eggs have long been symbols of fertility and possibly the earliest civilisation to paint them was that of the ancient Persians which decorated eggs for Nowrooz, a festival of the spring equinox. 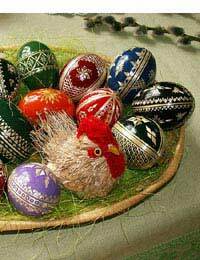 In both Jewish and Christian cultures eggs are used to celebrate the spring religious festival and in the Europe of the Dark Ages, many countries had traditions of decorating eggs and hiding them for others to find. Rubber bands wrapped around the egg in a random pattern. Roll the egg in some food colouring, leave it to dry and remove the bands. Wax – children’s crayons can be used to decorate an egg – draw a picture or pattern on the egg using light coloured crayons. Dip in food dye and then lift out and leave to dry – the crayoned area will remain free of dye. Marbled eggs – crack the eggshell gently all over with a teaspoon and then put the whole egg in a bath of food dye, or soy sauce. Leave for ten minutes for dye, three hours for soy sauce. When you peel off the shell you’ll find a beautiful marbled pattern on the egg white. A deliciously rich date pastry, served to celebrate Eid in Iraq. The rosewater gives this recipe it’s unique and wonderful flavour and fragrance. Make the pastry by rubbing the butter into the flour and sugar, then sprinkle with rose water. Add some of the water and mix with a broad-bladed blunt knife to form a firm dough. Put the dough in a plastic bag and put in the fridge for thirty minutes while you prepare the dates. Finely chop the dates and sauté them in the two tablespoons of butter. When they are soft, set aside to cool. Once the dates have cooled, take the dough out of the fridge, pinch off a piece and make a ball a little larger than a walnut – flatten it in your hands, put a small amount of dates on top and fold over to make a little half-moon shape. Prick the edges with a fork. Repeat until all the pastry and dates are used up. Bake for around thirty minutes, until golden. Diwali is the Hindu festival of light. It’s famous for the exchange of tasty sweets and this one is bound to appeal to even those who hate carrots! Wash and grate the carrots and rinse and dry the raisins. Chop the nuts very finely and use a pestle and mortar to grind the cloves finely and mix them with the same volume of cardamom powder. Melt the ghee in a large heavy non-stick pan and add the cardamom and clove blend, with the nutmeg, and the nuts, cooking over a medium heat for three minutes. Now add the grated carrots, stirring as the water evaporates and the volume of carrots decreases, then pour on the milk, lower the heat while cooking until the milk almost evaporates away, as you stir the pan to stop it scorching. Pour in the cream and condensed milk, stirring until the mixture begins to seem a little dry again. Finally add the sugar and stir until the halva dries and begins to leave the sides of the pan. Can be served warm or cold in small dishes with ice cream.